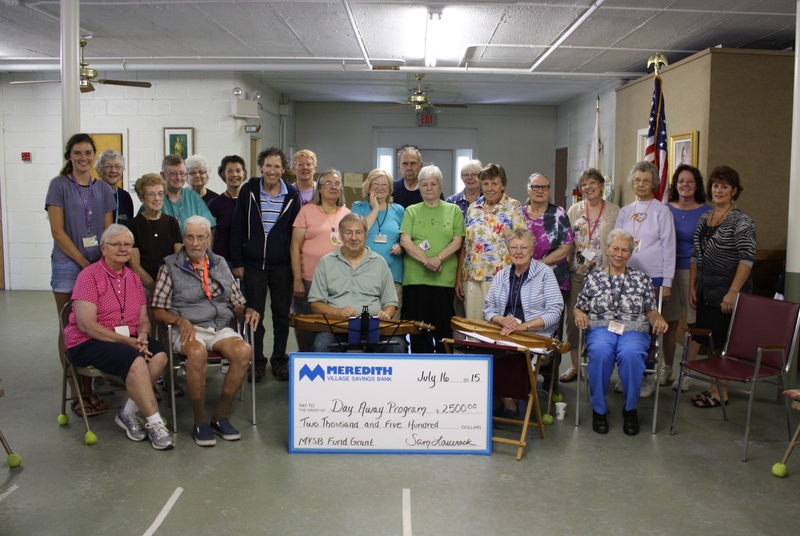 The Day Away Program held in Simard Hall at Our Lady of Grace Chapel in Bristol was selected as one of twenty-one local non-profit agencies to receive a grant from the Meredith Village Savings Bank Fund at the New Hampshire Charitable Foundation (MVSB Fund) this year. The program will use this $2,500 donation to help offset the cost of employing a licensed Registered Nurse to oversee the program. Day Away was designed to provide a period of respite for the caregivers of individuals in the early to mid stages of Alzheimer’s Disease or related Dementia. This respite gives caregivers the opportunity to have a needed break from constant care for a loved one, as well as a safe and fun day for the participant. Eligible participants spend the day with trained volunteer companions and enjoy a variety of social activities, including crafts, exercises and games, visits by local musicians and poets and enjoy the company of therapy dogs, and all activities are overseen by a licensed Registered Nurse.“Providing constant care for a loved one can be both physically and emotionally overwhelming for a family caregiver,” said Fran Olson, Founder and Administrative Coordinator for Day Away. “This program gives local caregivers the opportunity to take some time for themselves to recoup, while having the peace of mind of knowing their loved one is in capable hands.”Day Away is a nondenominational program open to all residents within the Lakes Region. The program is sponsored by Holy Trinity Parish and supported by Newfound area churches. The program is held on Thursdays from 9:00am to 3:00pm at Our Lady of Grace Chapel in Bristol, NH. There is a minimal fee which includes a light lunch and cost of the craft. Volunteers are always needed for morning and afternoon shifts. For more information about Day Away Program, please contact 603-744-6828 or franeolson@gmail.com. MVSB established the Meredith Village Savings Bank Fund in 1997 under the leadership of John Starrett who was then president and CEO of the Bank. Since then, 269 grants totaling $1,071,067 have been awarded to a wide range of environmental, social, educational, and historic projects throughout the Greater Lakes Region and Plymouth areas. Over the years, the Fund has supported literacy programs, after-school programs, environmental monitoring and education, restoration of historic structures, organizations that provide support for individuals and families in challenging circumstances, and equipment that helps save lives. The deadline for consideration for the next grant cycle is October 15, 2015. Applications are available on the Bank’s website and at all MVSB offices. Meredith Village Savings Bank, founded in 1869, is an independent mutual savings bank with 11 offices serving individuals, families, businesses and municipalities in the Lakes Region and the Plymouth area. The bank and its employees are inspired by MVSB’s core values: respect, integrity, teamwork, excellence, and stewardship. These values are intrinsic to every decision made at the bank and are illustrated by the high priority they place on trust, quality service, and commitment to community support. MVSB strives to make the communities it serves a better place to work and live. More information can be found at www.mvsb.com.